We’re in a kind of golden age of doing it yourself. There are so many tutorials and videos online now to show you how to do just about anything you want to do. People like knowing that they’ve saved a few bucks doing the work themselves, and they love to show off what they can do. In fact, some people devote whole blogs to showing pictures of their DIY projects and sharing how much they saved. down epoxy flooring is not a fast job – at least not if you do it right. You have to prepare the surface properly, and you have to allow enough time for the materials to cure completely. It can be easy to rush the process and damage the surface before it has cured. Improper mixing can result in air bubbles. Interrupting the etching process can leave acid on the concrete that can stain or damage it. You will have to put in a lot of time researching the job, preparing the area and getting the right tools, and performing the job. You’ll also have to go without your garage for a week or two while the job is done. Do you really have the time for all of that? If not, you should just call an epoxy flooring contractor to do the work for you. Are You Really Saving that Much Money? A lot of people decide to perform their own house repairs or upgrades because they think it will save them money. But if you don’t do the job right, you can end up costing yourself a lot more money down the road. For example, you can damage your floor when you are preparing it for the concrete floor coatings, and that can cause the coating to fail later. You can make mistakes that require you to replace the floor or redo the coatings. All of this can cost much more money in the long run. Hiring an epoxy floor contractor in the first place will help you save the most money. Are You Adding Value to Your House? When thinking of the cost of concrete floor coatings, you also need to think of the potential cost in terms of lost value to your home. If you put the floor coatings in place yourself, will you do a good enough job to increase the value of your home? If not, you are costing yourself money. One way to think about this is to consider the results from the perspective of an outsider. When finished, do you think your floors will look the same as if a professional had done them? Do you think your floors will look like what’s in a model home? If not, you need to hire an epoxy floor contractor to do the work instead. Otherwise, you could be costing yourself hundreds or thousands of dollars later. Professionals have the skills and tools to put on Carefree concrete floor coatings safely. Do you? If not, you will be putting yourself and your family at risk. To lay epoxy flooring, you need to have acid-resistant gloves, eye protection (safety goggles, not sunglasses), and a respirator with a cartridge that can filter acid fumes. You also need a grinder that can handle the concrete dust that can contribute to lung disease. You need to wear protective clothing so that you have no bare skin that could be injured by acid splashes. And you can’t work in any enclosed spaces, such as your basement. By hiring a professional, you don’t have to worry about any of these issues. You can be sure that your floors will be finished professionally and safely. If you don’t perform the work well enough, you could become liable later. For example, if you empty the concrete dust or acid into a sewage drain or even woods beside your house, you can be hit with a big, fat fine. Or if you make mistakes on the flooring that lead to the injury of guests in your home, you could be held liable. Learning about proper waste disposal and researching all the local building codes can be time-consuming and frustrating. Hiring a professional to perform the work can save you that time and ensure that the job is done safely and to regulations, shielding you from liability. Concrete floor coatings can protect your floors, make them look nicer, and improve the value of your home. Hire a professional epoxy floor contractor to perform this work safely and accurately. You may pay a little more at the start, but you’ll save yourself a lot of money and aggravation in the long term. 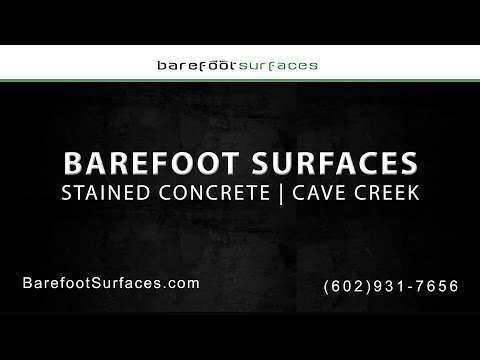 Barefoot Surfaces performs concrete floor coatings for homes and businesses throughout Arizona. We create beautiful, Carefree garage epoxy flooring, living area, or work space. The coatings protect your floors from stains and corrosion, creating more beautiful floors and reducing the amount of maintenance you have to perform. We can create beautiful floors in a variety of colors, and give you professionally installed patio epoxy floor coatings in Carefree. Call us in Arizona today to learn more about concrete floor coatings or to get an estimate for your job.